Oh lamb. You’re so cute and so delicious. For those of you who think eating the fuzzy little critters is evil, please stop reading now. For those of you who are salivating, please read on. This is my ‘go to’ for gourmet when you don’t have time for gourmet. Unlike most crock pot recipes that call for ‘fake’ ingredients (like canned soup or velveeta), this one is pretty much all natural and the results are impressive enough for company. The best part is whether you make it ahead or all in the same day, it really only takes two 15 minute intervals of effort. It’s a great option for a weeknight dinner party or a ‘dine-in’ date night. You’ll even have half a bottle of red wine left over to enjoy with it. In a frying pan, heat a couple of teaspoons of olive oil. Season the shanks well with the salt, pepper and Worcestershire and then sear well on all sides. Dump the remaining ingredients the bottom of the crock pot and stir. (If you want to be fancy, you can deglaze the bottom of the frying pan with the wine.) Add the seared meat and then add water to the top of the shanks. Cook on low for 8 hours. If you’d like, you can refrigerate the shanks (in the crock) overnight and skim the fat before reheating. If you’re going to eat them immediately, ladle two cups of the broth into a measuring cup and let the fat settle to the top. Pour the fat off carefully and then place into a small saucepan with 1 packet of beef base and some freshly ground pepper. Bring the mixture to a boil and then whisk in a slurry of a couple of teaspoons of cornstarch and water. This will form a rich gravy to serve with your lamb. 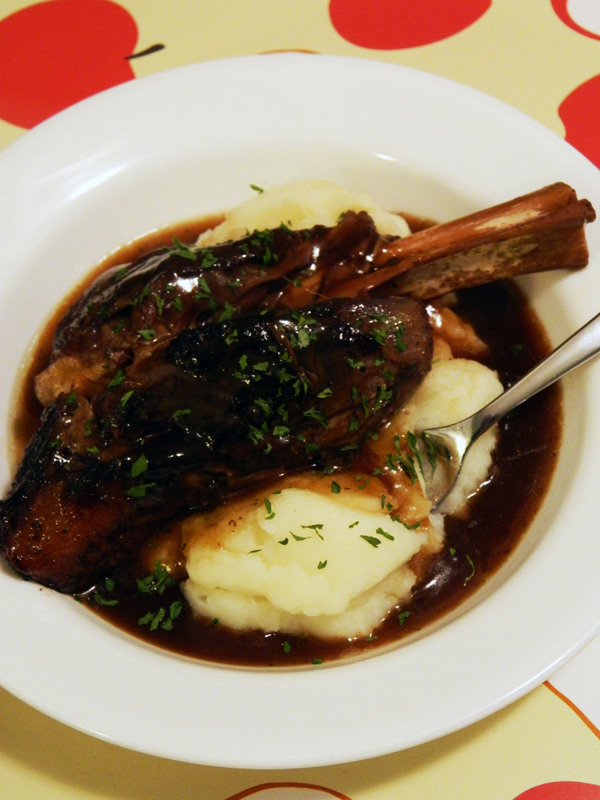 I like to serve the shanks on a bed of mashed potatoes. All the better to enjoy the gravy with. After returning home from Ireland, this recipe really made me feel like I back there again! One of my fav. recipes! Only thing I do different is wait to add the salt until the end, the pot roast spice is salty enough for me so most times I dont add the extra, but thats a personal preference. Thanks for posting! Glad you liked it Candice! What is beef base? Is it beef stock and what quantity?